Alicante is located on the eastern coast of Spain, along the Mediterranean Sea. It has a population of around 330,000 people and is situated in the southern part of the autonomous region of Valencia. Alicante is a rapidly-growing city with a majority of its economy coming in from the tourism industry. Although the official language for the entire country is Spanish, many locals in the region of Valencia speak Valenciano. 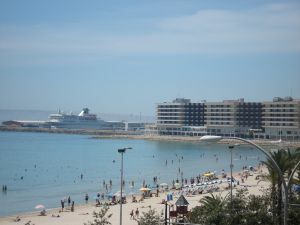 The weather in Alicante is typically nice, with an average temperature around 18 C (64 F). The climate in the region can vary, however, because of the dual proximity of both the Sea and mountains. From Alicante it is possible to reach many of Spain’s large cities by car or public transport within a matter of 4 or 5 hours. Also, near to the city you will find several tourist hot-spots, such as Benidorm and Denia. These resort cities are home to some of the best beaches on the Costa Blanca, but also draw the most tourists during the high season. Alicante has a deep, rich history which can be seen throughout the city still today, but it is also a lively, modern city. Alicante is also home to one of the most famous festivals in Spain, Noche de San Juan (Night of Saint John). The festival lasts for one week and there are many spectacles of firework shows and live music. Also check the Accommodation in Alicante section, general Facts about Alicante, its Gastronomy, Price guide for Alicante and Alicante Links.